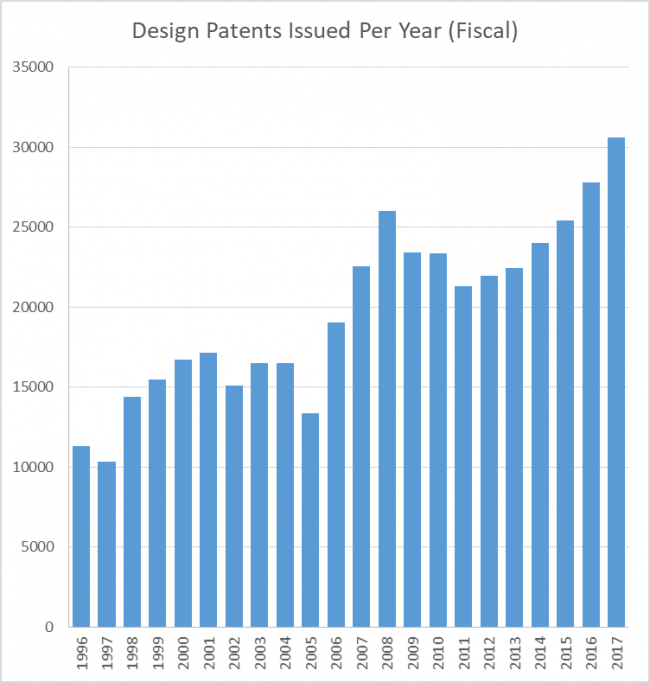 As with Utility Patents, Design Patents are also on the rise with a new fiscal year record for FY2017. 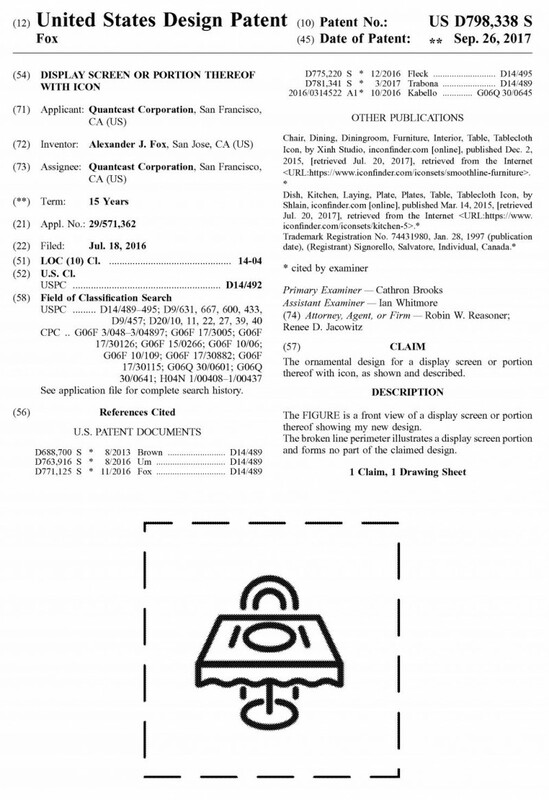 Shown below is an example patent issued last week to QUantcast covering their display screen icon. Another way to express this is that the recent Sup. Ct. decision on design patent damages for smartphones in Samsung v. Apple has made it no longer possible to collect damages for the entire profit on an entire multi-component product with a design patent on part of its exterior surface configuration. Worth nothing is that none of these designs are being examined, a large fraction of them are worthless junk displayed on an electronic screen, another large fraction are functional and not ornamental, and a huge fraction are obvious. Opinion? Or has anyone done any investigative study on this issue? If not, it would be interesting to see. Any facts or sources to back up this “patently” false claim? Of your three large (or huge) fractions – whatever that means – your “another large fraction are functional and not ornamental” catches my interest. Of what in particular are you referring to with an admission of ‘functional’ (aka having utility)? Example of overlap between design patents and trademarks re screen displays. Even one of the references cited is a TM. P.S. If you were wondering how electronic screen displays became design-patentable [even though electrical signals were later held not utility patentable by the Fed. Cir. ], it is due to the expanded-Board [including the Director] decision in Ex parte Strijland (Bd. Pat. App. & Int. 1992). Just another handout to the b 0tt 0m feeders who can’t help themselves. It’s exactly the kind of judicial activism that the Re pu k k k es love more than anything except (1) money and (2) sticking it to hippies and brown people. Let’s just watch the rich get richer while the system melts down. I mean, it’s rich people. Buy the gloves their selling so you can clap longer. Serious question: On principle, why should design patents be available for, say, the ornamental layout of a lamp, but not for the ornamental layout of a GUI? Those wanting to make money from patents (design or otherwise) – you know, your supposed clients – are just NOT synonymous with some singular anti-Left “e v i l” that you insist upon. The usual advice for you and your cognitive dissonance applys: please get into a line of work in which you can believe in the work product that your clients engage you to produce. Does this account for the recent change allowing more than one design per design patent?
? This is a single design. If by “this” you meant the numbers rather than this example, perhaps yes there would have been even more design applications, but how would there be any way to tell if more that one design is in the same patent other than by careful analysis of plural drawings, since three dimensional designs also require plural drawings? Yes, I meant the numbers and not the single example. As we do very little design patent work, I was curious as to what impact (if any) the liberalization of “family” drawings is having. The Perry comment of “one claim” is exactly what I thought was the opposite intention of the new legislation (although perhaps the caveat of ‘patentably distinct” might be read as (perhaps) the “family” effect being intended to widen the penumbra of what might keep others “out” as a type of 103 mechanism – albeit such would surely be a double-edged sword, if examinations were diligent. I am curious to hear from those who are seeing a jump in their actual active involvement. Does the bar chart take account of flings containing a plurality of designs? I suspect not. In that case, should we then suppose that the true rate of increase is higher than the bar chart suggests? As patent attorneys gradually realise they can have more than one design per filing, will the number of protected designs increase exponentially? Is the surge all because of the Apple/Samsung litigation, or are there other reasons? As with utility patents, you can only have multiple designs in a single application if they are patentably indistinct, which is rare. And keep in mind that only one claim is (currently) allowed per patent. Since this has always been true, the bar chart seems accurate. The surge, such that it is, is probably more due to the importance of graphical user interfaces which are becoming the gateway to everything. The effect of the A/S brouhaha will start to trend downward due to the gutting of design patents by SCOTUS.